As the figure suggests, stereophonic acoustic echo cancellation is not a simple generalization of the monochannel problem. Instead, stereophonic systems have to deal with the introduction of a second echo path they must model. Consider that you are in the recieving room on the left in the figure, and the far-end talker is in the transmission room on the right. Thus, to ensure zero error, stereophonic echo cancellation must contend with changes in the transmission room echo paths as well. In order to keep the error constantly zero, any change in the transmission room echo path must then be accompanied by a change in one or more of the receiving room echo paths with respect to the talker’s signal. In other words, the echo path with respect to the microphone-loudspeaker signal must be well aligned. As (3) shows, the implicit assumption to assure complete alignment, aka that , is that the microphone-loudspeaker signals are uncorrelated. If there were correlated in any way, we could not say with certainty that the adaptive filter had aligned, as the correlation may be artificially altering the microphone-loudspeaker signals, leading to low error due to happenstance rather than true alignment. One way to ensure the signals are uncorrelated is to decorrelate them yourself . Unfortunately, this scheme does not work for all frequencies. The missing fundamental phenomenon is a result of the majority of a signal’s energy being replaced by higher harmonics. Due to harmonic decay, the majority of this majority tends to be concentrated in the mid-range bands of the audible spectrum. Thus, the missing fundamental effect fails to work well with fundamentals above 500 Hz. 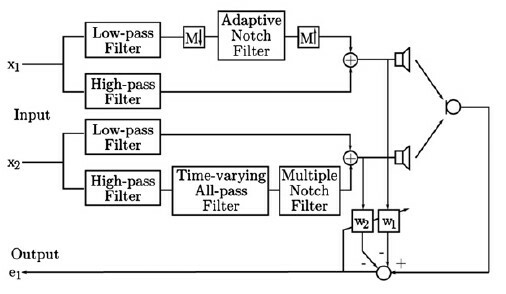 Instead,  uses phase modulation, and  uses an all-pass filter to provide further decorrelation of the signals. 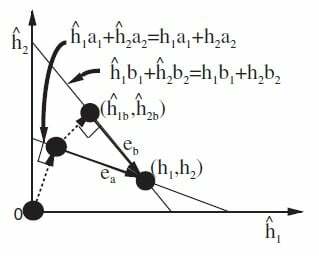 As the figure shows, if then varies to , the adaptive filter first converges to and then to . Notice then that |eb| < |ea|, and thus the error norm has decreased in the second convergence. 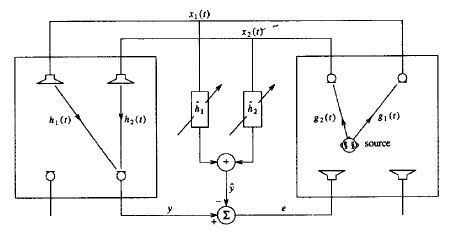 This is because the first attempt’s solution is used as a starting point for convergence, and this first solution is closer to the true echo path than the filter was before the first attempt. Thus, varying the cross-correlation many times, the echo canceller can arrive at the true echo path.